As we participate in God's transforming love, here are some of the activities that take place in our homes and on our church property. Support candidates and issues with your gifts, time and lawn signs. Speak up respectfully and positively. Be an informed voter, and VOTE! Project Home. Overnight shelter for families temporarily without housing. Our church hosts for the month of April! Serve as an evening or overnight host. Sign up during March (learn more at www.spacc.org). 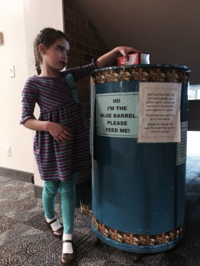 Blue Barrel/Minnesota Foodshare. Nonperishable food donated to the Blue Barrel in the atrium is delivered to Roseville Foodshelf for neighbors at risk for hunger and malnutrition. Monetary donations are even more helpful ($1 buys ~$9 worth of food) - anytime and especially during March’s Minnesota Foodshare campaign. For more opportunities to help, see Keystone Community Services. Earth Care Team is dedicated to a better understanding of the connection between our spiritual and environmental beliefs and ethics. Their main goal is to advance improved environmental awareness among our church community through educational resources, events and promotion of sustainable practices throughout the church. Holiday Fair Trade Market. A wonderful opportunity to shop for gifts that give twice – fair trade items made by artisans from around the world and non-profit benevolences for gift donations. Held in early November right here at the church. Ministry of Quilts. Our Quilters meet at church at 9am on Wednesday mornings and at 6:30pm on the 2nd and 4th Fridays of the month. This community of quilt makers make dozens of colorful and comfortable quilts to donate to persons in need in our community. You’re welcome to join in! No sewing experience needed! North Como Preschool. This licensed preschool serves 3 through 5 year olds and is open to any child regardless of race, religion or gender. The church provides scholarship funds and a portion of the building usage cost as an outreach ministry. Seeds of Hope Community Garden. Garden plots in our churchyard are offered to persons from the congregation and community. Several plots are dedicated to growing hundreds of pounds of produce for local food shelves. The gardens are a beautiful part of our churchyard and an inviting outreach. Sign up in the early spring. Like our Facebook Page!